I’ve recently been given the opportunity to do something remarkable. Starting next week, I will be teaching a new class, one that I’ve never been able to teach before, one that lies a bit outside my comfort zone, one that I’m sure will lead me down the path of inquiry, uncertainty, and exciting discovery. I’m going to teach a Maker class. While the idea of making, tinkering, or design thinking are not necessarily new ideas to me, the idea of teaching an entire two-week class around this concept is. At first, I scratched my head, but as I sit here, with a skeleton of plans ready for next Monday when my almost-twenty students will arrive excited for their summer session, I find myself feeling the thirst for the classroom that I start to feel every year at about this time. While my summer has been filled with curriculum development, collaboration with colleagues, and the oh-so important reflection time, planning for this class has helped me to remember what I love about the classroom: the dancing complexity of each and every variable, the thrill of predictive anticipation coupled with unknown and unreliable outcomes, the thought of collective excitement and subconscious energy bouncing off every surface. But this time, it feels a little bit different. It feels different, not just because it’s a short class, and not just because it is a new topic, but because I can feel my mind melting and molding, reshaping itself into this new context. In fact, the most remarkable part of this process so far has been starting anew. Up until now, a great deal of my planning and preparation has been more so academic focused. My objectives have lied primarily within english, language arts, math, science, humanities, and social-emotional curriculum. It has been a rare occasion that I have been able to focus so acutely on teaching my students the art of making, and as a result of this change in planning, it has allowed me the opportunity to be even more so metacognitive. I now have the chance to really look at how I plan, not necessarily as a new teacher, but as a teacher learning something new. I began my process as I usually do, brain-dumping thoughts out into a blank space, this time, on my living room window, since no whiteboard was available. I listed out possible essential questions, refreshed my memory on the Design Thinking process, and began to wonder how I might structure the two weeks we had together through quantifiable objectives. But I got a bit stuck. Yes, I had my essential questions and a general understanding of what I wanted my students to know and be able to do at the end of the two weeks, but it all wasn’t quite as clear as it usually is — that is, when I plan a reading or math unit. The start of my planning! In the textbook version of backward-design planning, though, this is generally the route one is intended to take: begin with essential questions and enduring understandings, plot our essential outcomes, deconstruct them to create success criteria, and then plan your instruction accordingly. This, however, didn’t feel that easy, even though I had followed many of these steps. 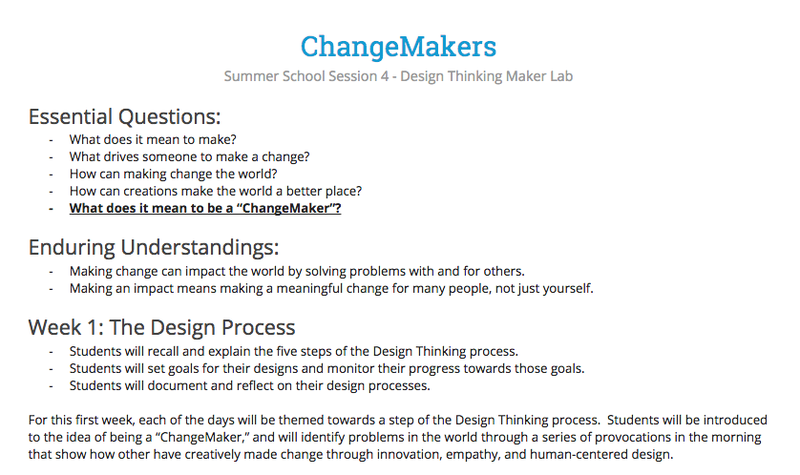 I came up with questions related to “change” and “impact,” and even decided I wanted to theme my class around the act of making to make a difference, in an effort to teach empathy and selflessness through making. But it didn’t seem complete; my unconscious mind was telling me that something still wasn’t quite right. I had few reference points on which to rely and few concrete experiences through which I could curate this new experience, but I had trouble plotting out my day-to-day objectives. I struggled to come up with anything entirely coherent. So I Googled a few things, looked up design challenges, and allowed the magic of forced provocation to strike a chord somewhere in my brain. I found some great activities, listed them in my notes, and even managed to loosely relate them to my theme, but something still felt absent, even after all of this work. This planning process had never failed me before, but it seemed to be failing now. Perhaps it was the presentation of such soft-skilled objectives like perseverance, tolerance of uncertainty, empathy, and perspective-taking, that made the outcomes so much less intangible. Or maybe it was just that I needed a break. So I stopped working for a bit, my notes living on the window in my apartment, thoughts swimming around in my subconscious while I made a bit of homemade pizza and sipped some rosé. In David Brooks’s book, The Social Animal, he discusses the subconscious a great deal — its subversive power, its immeasurable abilities, its dark, passionate depths. He conveys the power of the subconscious, not only through narratives of seemingly real human beings, but also through clever anecdotes that help readers realize just how much power the unconscious mind has over us. Specifically, Brooks says, one of the reasons that people need to take breaks is because it gives the unconscious mind time to synthesize information behind the scenes. Too much rational thought–too much intentional thinking, rational rethinking, and obsessive overthinking–can actually be counterproductive. So it seemed that during that time, watching Scandal, eating pizza, and sipping pink wine, all of the rational pieces of my planning — the scope, sequence, goals, and objectives — were coagulating beneath the surface of rationality, swimming in the immeasurable, and sticking to each other, for just as I was about to go to bed, my subconscious rang a bell, and that moment of realization rang in my mind, illuminating my dark apartment and the notes that were scratched into my windows. While I had already decided I would combine the idea of making and social consciousness, I hadn’t at that point figured out how I would translate it to children, but when the word “ChangeMaker” came into my mind, I felt like I had struck gold, that I had “done it,” for lack of a better word. The idea of being a “ChangeMaker” added personality to these plans; it added identity. And that’s exactly what my little makers will need to see the relevance in this upcoming summer school session. Interestingly enough, when I think about these plans and how they’re shaping, I’m seeing a parallel between the subconscious mind and the rational mind. My plans, scattered about in lines and boxes, denote the rational piece of planning: the pieces that show linearity, sequentiality, and perhaps even predictability. But the other piece of my planning represents the subconscious part of my mind, and the subconscious pulse of the classroom — the place where passion is stirred, where interaction is immeasurable, and where identity lies. I think we all struggle with this. This idea that our plans–what we have prepared to put in front of our children–never truly represents what we believe we can do with our kids. It never actually shows all the nuances of our intentions, and it will never be capable of that. Instead, a planning document is our best shot at translating our thoughts into something reproducible for someone else. If nothing else, this process of starting anew, of taking on a project that lies outside my comfort zone, has shown me that the classroom is, in fact, a magical place, filled with boundless and incalculable variables. At the end of the day, we need to do our best to prepare, but to also remember to trust the subconscious pulse that not only sits below the surface of each and every one of our brains, but beneath the surface of our classrooms.